The WPF Docking control provides an interface to create Visual Studio-like dockable windows and provides floating panels, autohide, and tabbed documents. 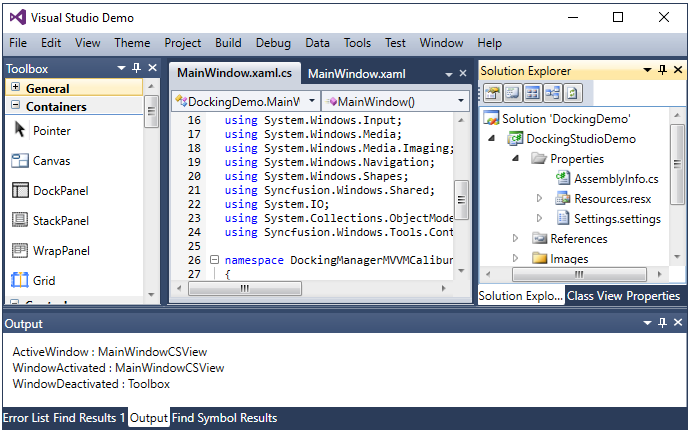 The WPF Docking Manager Control provides an interface to create Visual Studio-like dockable windows in your applications. Dock panels support many interactions like docking, floating, tabbing, autohiding and grouping document tabs. Tab groups split the workspace and allow users to work with two or more open documents. Users can resize, move, and change the behavior of windows to create a layout that suits various development models. Dock and floating windows - Dock windows at any side of a container. End users can dock and float windows interactively through drag and drop. A display of the dock preview helps show where the floating panel will be placed. Tabbed windows - End users can group the dock or float windows in tabs. Docking guides help you dock a window over or beside an already docked window. Position tabs horizontally or vertically in a group of dock or float windows. Customize the appearance of tabs and panels in a group of dock or float windows. Pinnable dock windows - Pin and unpin the groups of dock windows not being used in a container. Tabs for each unpinned window appear on the edges of the container. Hovering the pointer over one of these tabs will bring the related window content into view with smooth animation. Tabbed MDI Forms - Create document groups in your application using a Visual Studio-like tabbed document interface (TDI) and a multiple document interface (MDI). Utilize tab group creation in both horizontal and vertical orientation, as well as quick switching of documents. This allows users to work with more than one document at the same time and seamlessly switch back and forth between docked windows and Tabbed MDI forms. Users can close windows interactively through the close option in the UI. Close the active window alone or all tabbed windows. Users can interactively resize windows using a splitter between windows. Restrict resizing to minimum and maximum sizes for views. Display the dock windows in maximized view to get more readability and restore interactively. Turn on or off the option to show a window’s contents while dragging it. When off, a transparent dragging visual effect is used. Snap the float windows and move them together. Separate the snapped float windows by pressing the CTRL key and dragging the float window away from the group. End users can restrict windows to docking on specific sides of the target dock windows or edges of a form. They can customize the dock hints’ visibility to show dock hints only on a specific side. Built-in redock support saves the previous state of dock or float windows and moves the windows to previous dock or float states after double-clicking on a caption. Bring the overflow tabs into view through scroll options in the UI. Scroll to the next, previous, first, or last tabs. Display docking guides to indicate the valid drop location for docking panels while dragging the float window. Also customize the appearance of the docking guides. Improve the user experience with a built-in context menu. It helps users float, close, pin, and move the dock window to a tabbed document and more. Hide the visibility of a dock window caption to make the dock window appearance a flat panel. Built-in serialization options support saving a dock layout upon closing and restoring it upon opening the application in different formats. Users can create nested docking layouts with docked windows inside other docked windows, or directly dock them to the main form. Easily drag the child windows from one docking manager to another by linking different docking managers together. Customize the style of each part of the WPF Docking Manager, such as its dock window header style and tabs styles. Use a rich set of built-in themes inspired by popular interfaces such as Visual Studio, Microsoft Office, and Expression Blend. The WPF Docking Manager supports localization to translate the static text to any supported language. Right-to-left (RTL) direction setting is available for users working in right-to-left languages like Hebrew, Arabic, or Persian.